The Drake Center for Veterinary Care in Encinitas has a long history of giving back to the community it serves. Besides partnering with FACE to provide life-saving veterinary care to families and pets in need, The Drake Center also works with other charities and rescue groups, and is committed to introducing young people to the career of veterinary medicine. Dr. Michele Drake is the driving force behind the hospital’s dedication to its patients and the larger community. Beginning in 1992, with the purchase of Westlake Veterinary Clinic, followed by a merger with San Dieguito Veterinary Hospital to form The Drake Center, Dr. Drake has grown the practice into a state of the art facility with 30 dedicated staff members. Dr. Drake values the partnership with FACE, noting that together we are able to offer a tremendous resource to clients and patients in need. Dr. Drake believes that one of the key elements of the partnership is the commitment to education shared by both The Drake Center and FACE. “At The Drake Center, client education is a major cornerstone of our practice. A fundamental partner in pet health care, we believe clients make the best decisions when they are well-informed and it is our goal to provide them with the information they need,” says Dr. Drake. “We love that FACE shares this goal and that the promotion of client education is such an important part of the organization’s mission.” Dr. Drake and her staff have enjoyed collaborating with FACE over the years. Working with FACE is “an invaluable resource for any veterinary hospital,” she notes. She is especially proud of our work to help save Drake patient Rico, a four year old shepherd mix receiving treatment for a mast cell tumor at the Veterinary Specialty Hospital. FACE was awarded a special grant from the Petco Foundation and Blue Buffalo and has been able to assist Rico’s family with the chemotherapy. Rico is the first pet FACE helped with this grant! A family that includes two boys, three dogs, and two cats keeps Dr. Drake busy when she is away from the hospital. She enjoys playing tennis, taking care of her boys, and volunteering at the local YMCA. Her four-legged family members also get lots of attention. Never one to play favorites, Dr. Drake says that she enjoys taking her dogs for runs during the day and snuggling with her cats at night! 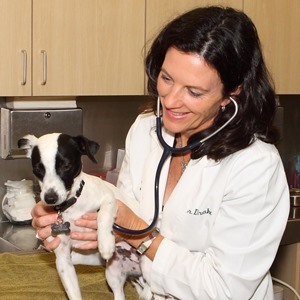 As both a pet parent and veterinarian, Dr. Michele Drake understands the importance of pets in our lives. “Seeing the relationship between clients and their pets is both endearing and motivating,” she says. “I love having a role in enriching the human-animal bond.” And we love Dr. Drake and everyone at The Drake Center for Veterinary Care for the work they do in helping to keep FACE clients and their pets happy, healthy, and together!